There has been some interest in the club establishing another 2m repeater, but lacked a duplexer. A couple of old cavity resonators were discovered in the back shed. We were able to tune these very quickly and easily using the new Chinese KC901H network analyser (more about that in another post). Why and how they work: an antenna in a box! Up to that point I had heard of cavity resonators but had little idea of how they worked or how they were made. Similarly, so was my knowledge of repeater. However, as I started to learn about them, I became quite intrigued with the technical finesse of being able to transmit and receive with the same antenna simultaneously, albeit on different frequencies. Further, as desirable repeater sites are restricted in number, many repeaters share the same site, again on different frequencies and bands. The solution to the repeater problems is in using very selective band-pass and/or notch filters, which is what cavity resonators do. For a 2m repeater, the TX and RX signals are 600 kHz apart, very close at VHF, there expensive. The receiver needs band-pass for RX but a notch filter for TX. As such a duplexer consists of a series of cavity resonators to give the necessary rejection of the TX signal relative to incoming RX signals. 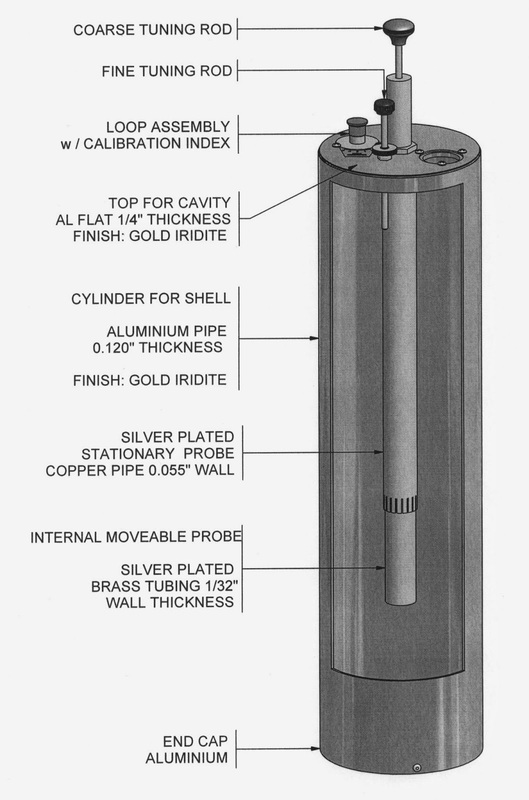 On initial reading, cavity resonators were complex mechanically and electrically, needing silver-plated copper cylinders and intricate adjustment mechanisms. 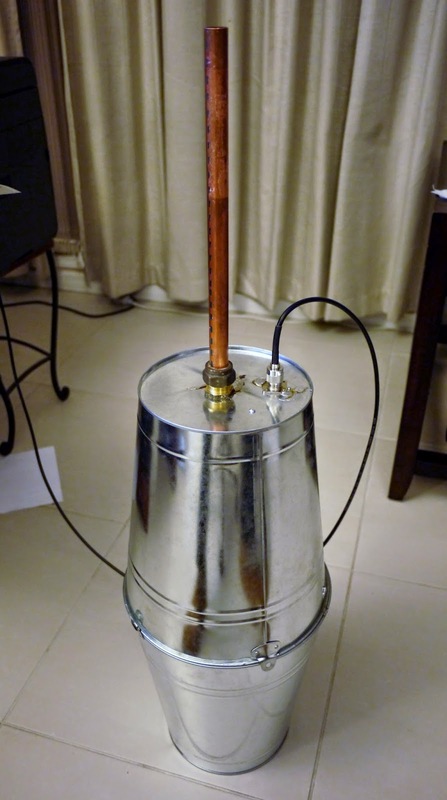 However, I came across an article on the commercial use of aluminium beer kegs as the basis of cavity resonators for FM radio stations, to minimise spurious emissions: http://www.ingenia.org.uk/ingenia/articles.aspx?Index=240 . On closer examination, a cavity resonator is just a 1/4 wave antenna in a closed conducting space. Sometimes a capacitive loading hat is used to mechanically shorten the antenna. Effectively, the cavity resonator uses an antenna as a RF short-circuit at its resonant frequency, with the Q of the circuit being as high as possible, typically around 8000 to 9000 to give a sharp 30 or 40 db notch. Two or more together gives the desired 80 db or there about. The design of cavity resonators then seemed more a compromise between size, complexity, cost and performance. I thought the only way to learn about them and possibly develop a usable low-cost device was to build one. I went down to the local hardware super store with an open mind about what I could use, although after something that didn't require a lot of detailed metal work. Galvanised gutter pipe seemed like an idea, as I could solder it. However most guttering and roofing is zincalum, a alloy of zinc and aluminium that can't be soldered, but should have good RF conductivity. The copper plumbing section was an initial target. The solution was a bit unexpected, but that was the idea of just looking; creativity versus paralysis by analysis (or good old procrastination). While a galvanised rubbish bin looked good, it seemed a bit big. However, two galvanised steel buckets seemed to have the most promise. In the commercial resonators, they used a large diameter base for the antenna and a smaller section for the adjustable part. I thought, why not just use a large section for the whole antenna. A piece of hard-drawn 3/4" copper pipe and a brass compression fitting with a copper olive seemed a good start. So I set to work to build it. I had to file out a small lip in the fitting so the pipe would slide through. The pipe has a piece of galvanised steel soldered on the end as a capacitive hat. The pipe slides through the compression fitting, with some thick braided copper wire to stop the copper olive being compressed to much during initial adjustment. I used a UHF connector with solid insulation for attaching the input loop, again a piece of electrical power cable, about 200 mm long; I didn't have much idea of how it was designed, other than what I had seen. In all, about an hours work; I didn't have much daylight and wanted something to test. The first draft looks pretty rough; it is. Everything was done quickly and just tack-soldered. I should have taken a photo of the inside but was in too much of a hurry; maybe latter. Not very optimistically, I connected a RigExpert antenna analyser to it with a very wide range, as I had little idea of where it may be resonant. A disappointingly small dip in SWR was present; better than nothing I though. Reducing the range gave me a deeper and deeper notch, to the point that it seemed to be working quite well at a random frequency. After dinner, and inside, I tried adjusting it to a specific frequency, 146.1 MHz. It was a bit sensitive, but possible. 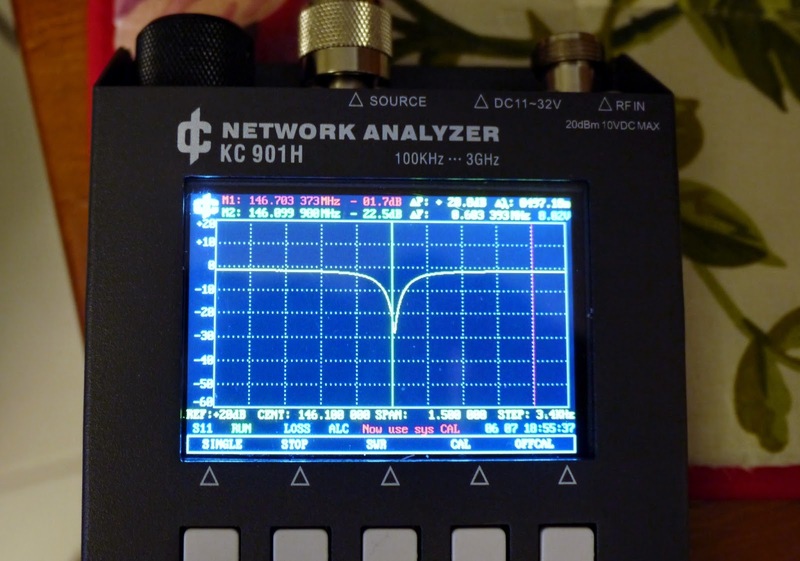 After tuning the device I tried it with the KC-901H network analyser. It shows a notch of about 30 db, (uncalibrated but good enough). I was pretty impressed as the commercial ones only achieve a little more than that. So, I use three resonators rather than two, not a big deal at about $40 to make. While quite a deep notch, it is quite sharp. The red cursor is 600 kHz away and well clear of the green cursor on the notch. The Q seems quite high. I could probably calculate it, but at the moment it seems quite sufficient for its purpose of proof-of-concept. What I learned: big is better? On reflection, commercial cavity resonators seem to be a major compromise between size in particular. The bigger the cavity, the less importance of surface conductivity and hence silver plating; that is probably why the beer kegs worked. However, in most commercial repeater sites, space is at a premium. I suspect the capacitive hat is used to reduce size as well; that it partly why they are used with antenna, as per my posts on the TET-Emtron antenna. I will try my device without the hat. I think it will reduce sensitivity in tuning as well, which is a good thing. Stability is a problem, the steel bucket bottom flexes. There were heavy-duty buckets, but they were $5 more than the $10 ones I used (poor man pays twice). The problem is not the cavity, rather the top were the pipe is attached. I can fix that using a thicker piece of galvanised sheet from an ant (termite) cap or a nailing brace; all the weird sources of galvanised steel sheet. The thermal stability may poor; commercial materials with opposite thermal properties are normally used to compensate. Again, a larger size may reduce the problem. Similarly the sunny Gold Coast only has a temperature range from about 5 to 35 degrees, rather than the -30 to 45 degrees in some places (like inland Canada). I will compare my device with the twin cavity duplexer at the club to get a benchmark. I could make another one out of a pair of heavy-duty buckets, but I am more inclined to try the steel rubbish bin. It is larger again, but easier to use and experiment with, such as attaching the input loop. I would like to try it as a band-pass filter, with input and output loops. This is quite insightful. 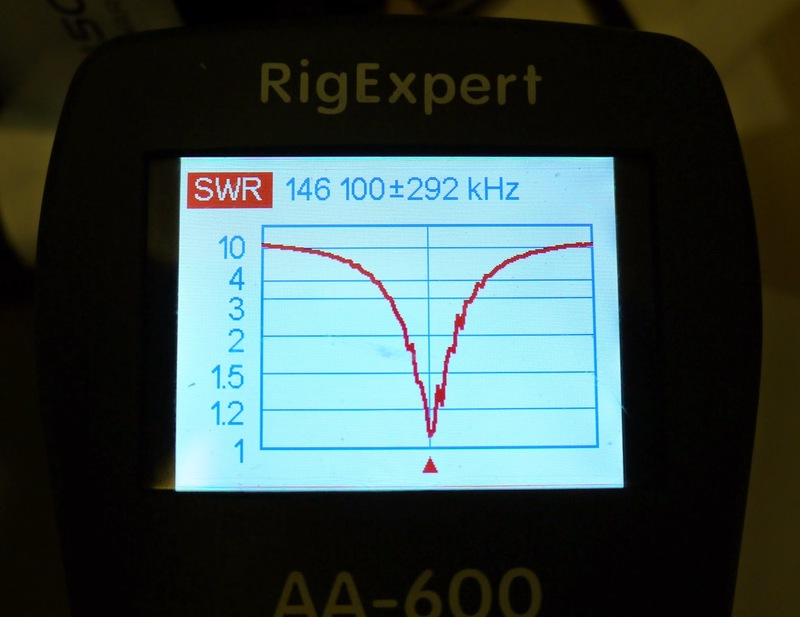 I am planning to buy an antenna analyzer, and i have seen you have been using the Rig expert 600 and K901H.my question is, can one do with either in tuning filters and antennas..? Hi Paulo. There are many posts on cavity filter and duplexers, I find them fascinating and challenging. There is a new post today on some very good pass-reject filters. How would you use one? Or does yours not have a second port for the signal to come out thru? Hi Bill. A lot of cavities have just one port. In and out is done by a T piece. This one uses a simple loop and acts as a notch. There are a couple of my posts in 2018 on a single port pass-reject coupling that works very well. This is one of the first attempts at making a cavity filter. i was thinking buying eight and making four bucket filters..